Sussex won their first Specsavers County Championship match of the season in some style, defeating Durham by an innings and 177 runs at Hove on Wednesday afternoon to take a maximum 24 points. There was some heroic batting, once again, from Durham’s Ryan Pringle, who batted for four and a quarter hours for his unbeaten 38. That followed his first innings 60, when he batted longer (152 minutes) than any of his team-mates. But it was nowhere near enough to deny a Sussex side who appear to be transformed by the return of Vernon Philander, Luke Wells and Chris Jordan. The match finished shortly after lunch on the fourth day. Sussex were outplayed in their championship opener against Kent at Hove last month, but the return game at Tunbridge Wells this weekend could be interesting. Durham resumed on 97 for four, still 284 runs behind. Sussex broke through with the fifth ball of the second over the morning when Paul Collingwood was lbw to David Wiese. He had not added to his overnight 31. 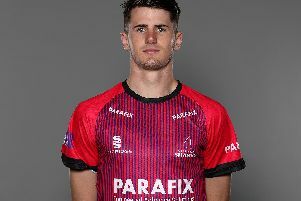 Paul Coughlin then lost his middle stump to Jofra Archer, shouldering arms, the ball appearing to deflect onto his wicket via his gloves. Stuart Poynter was the seventh Durham batsman out at 126, caught behind off Archer for a duck. At lunch Durham were 194 for seven, still needing 187 runs to make Sussex bat again. Sussex took the new ball immediately after the break. It was shared between Archer and Philander, who bowled most impressively in this match after returning to the county with a groin injury suffered while making his debut against Kent. In the end, Sussex swept away the Sussex tail. James Weighell had top-scored for Durham with 58, his maiden first-class fifty. He hit Chris Jordan for four fours in an over, three driven square on the off side and another pulled over midwicket. But he had not added to his lunchtime score when he played around one from Archer and lost his leg stump. Then Philander, bowling with pace ad aggression from the Cromwell Road end, had Chris Rushworth caught at third slip. Graham Onions, who bowled only ten overs in the match because of a sore back, did come out to bat. But it didn’t make much difference. Philander uprooted his middle stump first ball.